‘Dungeons and Flagons’ event poster found in corner of Travelling Man. Travelling Man sells a range of comic books, graphic novels, board games, manga and zines as well as regularly hosting book/comic signings and game tournaments. 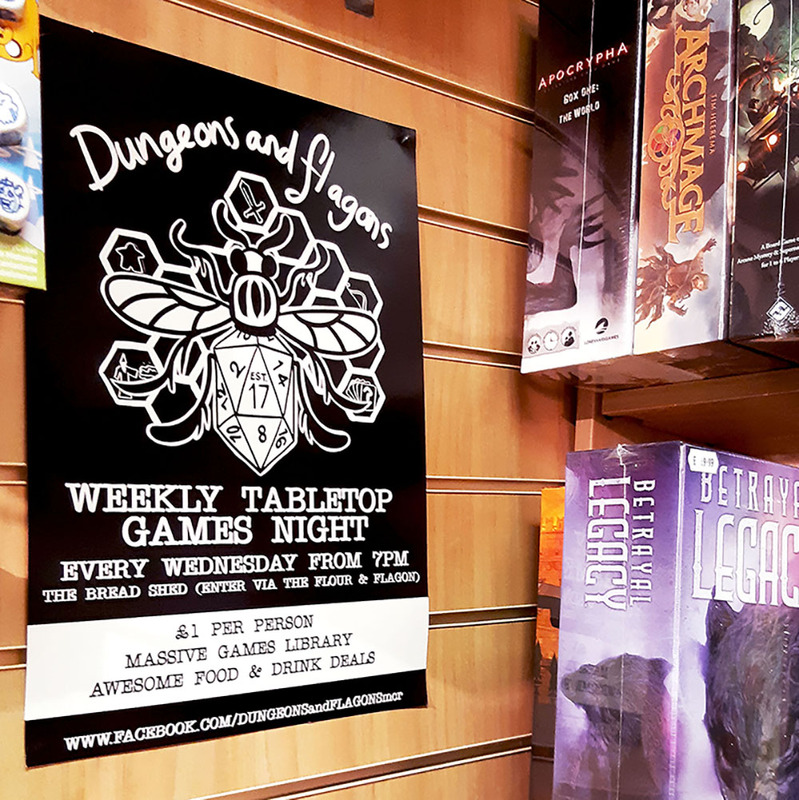 You can find plenty of posters dotted all round the shop advertising local gaming tournaments and socials as well so you can meet up with fellow fans. FanBoy3 is a fantastic shop located not far from Piccadilly Gardens that sells board games, card games, equipment for Dungeons and Dragons sessions and even more “casual” party games like Cards Against Humanity. Their staff are very friendly and always willing to help you find the exact card pack, game or product you are looking for and you can also stop for a brew and a snack in their own cafe: Fan Boy Tea! Hoot is a hidden gem that you can find in the Arndale down the corridor in-between Sports Direct and Timberland. They are a not-for-profit gift shop that stock licensed Harry Potter and Game of Thrones merchandise. 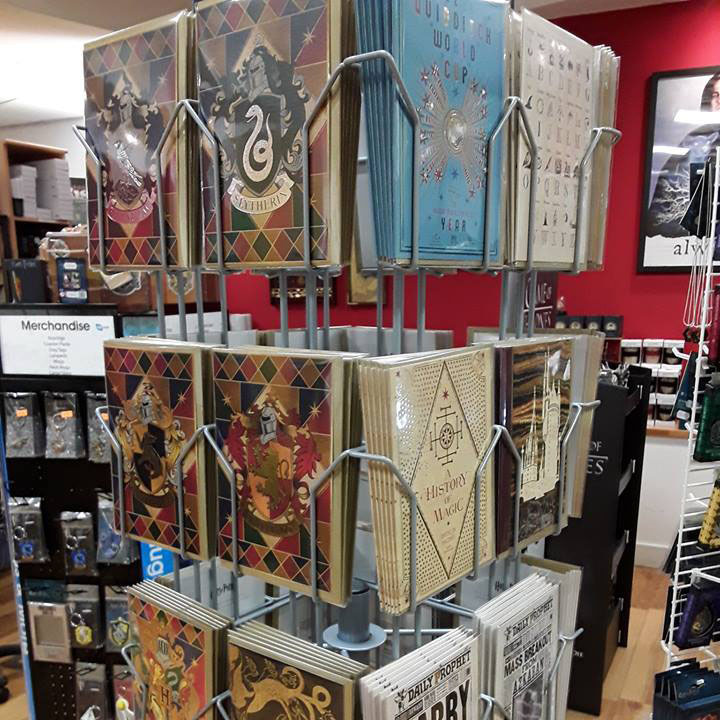 Why go all the way to London for your Harry Potter goodness when you can find it right here in Manchester? Plus all money raised by Hoot goes to funding Shopmobility Manchester and the staff are incredibly lovely and willing to help you find exactly what you’re looking for if you ask them about a particular character item or Harry Potter wand! A small section of the Pop Vinyl shelves in Forbidden Planet. 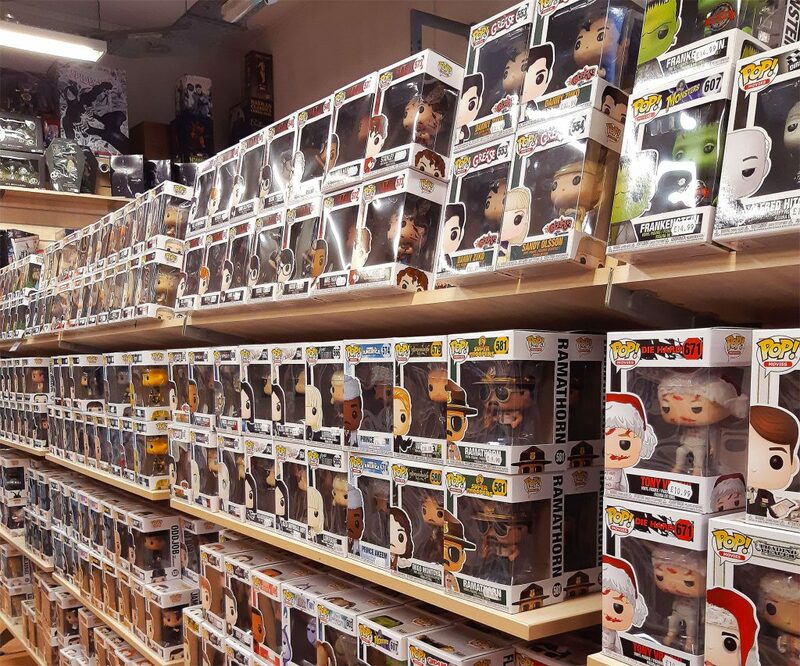 Forbidden Planet is literally every Funko Pop Vinyl collector’s dream. With one whole aisle dedicated to them – this is the place to go to buy your next figure. They even do store exclusives you can’t get anywhere else! The store has two floors with a wide selection of merchandise, books, clothing, artwork and comics. Fab Cafe is known as the “world’s first TV and movie themed bar”. Originally opened as an “antidote to the mainstream” you can come here to listen to some fantastic alternative tunes and have a drink or two. As well as that they regularly hold “Gaming Tuesdays” where you can play both classic and modern gaming consoles, and occasionally they do “Geek Nights” and WWE Screenings! If you’re looking for somewhere to go on the weekend after a week of hiding in the library – Hold Fast is the kind of bar for you. A nautical themed bar in Northern Quarter that not only does quirky cocktails – you can also chill out and have a go on some of the retro consoles and board games they have in the back. What could be a better night out than having a cocktail and playing some Crash Tag Team Racing? If you know Manchester, you know Afflecks Palace. But if you’re new to the city – drop everything you’re doing right now and go visit it! With four floors of independent businesses and creatives, this is a great marketplace for scouring for one of a kind nerdy stuff. If you’re a big fan of anime and the “Studio Ghibli” films pop into “Sunflower” on the second floor for My Neighbour Totoro goodness. There’s also the Star Wars Man on the third floor who sells tons of sci-fi and comic book merchandise. Alongside that there’s also Retro Play on the third floor if you’re looking for any old Nintendo 64 or PS1 games. What’s great about Manchester is that groups of people regularly put together hobby groups and meetups that you can attend to meet other people who enjoy what you do. A cafe literally next door to Travelling Man called Nexus Art Cafe has a monthly meetup called the “Nexus Gaming Group” which is a collection of people who share a love for tabletop gaming. They regularly meet on particular Tuesdays every month from 7pm-10pm. Find out more details in the link below! If you could ask Infinity War’s @wongrel anything, what would it be? Comment down below, or ask him yourself at MCM Manchester this weekend! Do you know any more places that could be added to this list? Feel free to comment below!